President Ilham Aliyev has said projects Azerbaijan is implementing together with Turkey redraw the energy and transport map of Eurasia. 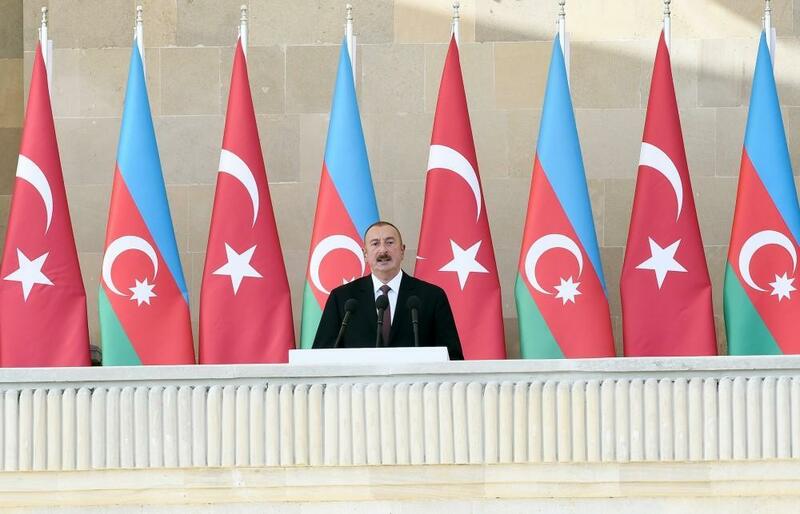 Addressing a solemn parade celebrating the 100th anniversary of the liberation of Baku from the Dashnak-Bolshevik occupation, President Ilham Aliyev hailed the Turkish-Azerbaijani energy and transport projects. “Baku-Tbilisi-Ceyhan, Baku-Tbilisi-Erzurum oil and gas pipelines, the inauguration of TANAP this year are historic projects.” “By implementing joint projects, Azerbaijan and Turkey redraw energy and transport map of Eurasia,” the President said. The head of state referred to the launch of the Baku-Tbilisi-Kars railway in Baku last October, which was attended by the Turkish leader. “This railway is a new transport artery. The volume of goods transported through this railway is increasing and will increase. The importance of our countries is growing,” the President added.